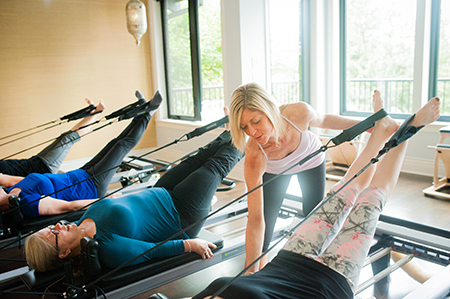 Apparatus / Equipment Based Pilates - Reformer, Cadillac, Chair - CoreBody Pilates + Yoga Inc. Apparatus based exercise is utilized on our pilates machines with spring-loaded resistance working the whole body synergistically. Learn the essential and intermediate series of exercises based on a mix of STOTT, Classical and Marie Jose’s style of pilates methods. Derived from Joseph Pilates in the early 1900’s, the pilates method is a progressive approach that is both safe and effective. The machine based apparatus training includes: Reformer, Cadillac and Chair based work and focuses on specific breath patterns, proper alignment, core stabilization, as well as muscular endurance training. 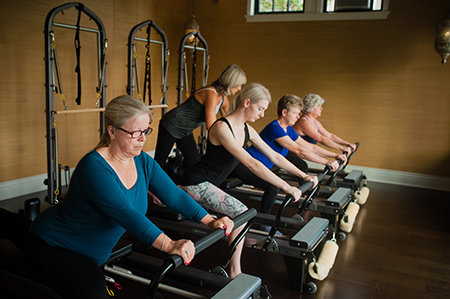 Our Deep Cove studio has 4 reformer/half cadillac machines from Balanced Body and 4 Balanced Body split-peddle chairs to utilize in any apparatus group class or privates. Those new to the pilates method and or machine based “apparatus” training, must begin with private sessions. The number will be dependent upon your previous mat experience and discussed with the instructor who can assess your level. Most new clientele start with our 1st Assessment and take our intro package of 5 privates all at a reduced rate to see clients roll into this work (literally)! From here if you are interested in a group apparatus environment, you will be placed in a small groups of 3-4 individuals to progress through the essential exercises. We try our best to make good matches between your schedules, and your experience levels. Those with more experience will progress from essential work into intermediate level training whereby there is an understanding of and can proficiently perform all essential exercises. Muscle flexibility, core abdominal strength, coordination and balance are challenged at this level. Pilates group apparatus based training is by appointment only and for those with apparatus experience. 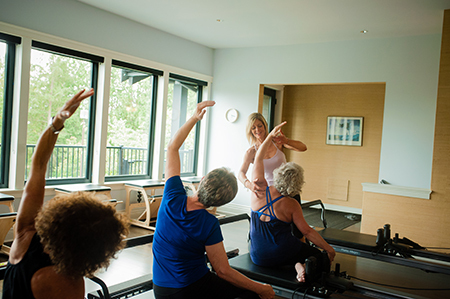 If you have either taken 4 private sessions with CoreBody and or have prior experience on the reformer, cadillac, and chair this may be the perfect opportunity for you to join a group apparatus session! Those interested should contact Stephanie Roberts by email at nvcoregirl@gmail.com or phone the studio at 604-916-9335, as soon as possible to ensure every opportunity is taken to find an appropriate group to join people with the same apparatus experience. CoreBody can’t guarantee group classes, but will do their best to accommodate client schedules. To book a Pilates class, contact us or click Book Online to register!